My weight has never been consistent, my body is very obedient, sometimes too obedient! Depending on the treatment that it is being subjected to, it has the ability to lose weight really fast, or gain weight really fast too. So up until the 1st of September 2013, I have had a torrid love, hate relationship with my body… More hate than love. All I had ever wanted was to feel approved and accepted by those around me, I wanted desperately to be liked. It has taken me years to learn that that approval and acceptance starts from within and whether others like me or not does not have anything to do with the measure of my self worth… But growing up, I based my worth on what I perceived others thought of me. So sad. But this was my reality. There was one thing though that I could always find comfort in, one thing that always accepted me: Food. And lots of it! I stepped onto the scale and saw a number that I never thought I would see… 100. I had officially entered the triple digits. I have no idea why I was shocked because I had been headed there steadily. Nonetheless I was still shocked. Caroline Schoeder wrote: “Some change when they see the light… Others, when they feel the heat.” I decided right there and then that something had to give, and that something had to be me. So I moved! And I slowly started shedding the weight again, this time around it was much harder than the first time… Until I came across a comment that Craig Brown made on someone’s post on the SleekGeek Facebook group, something about what he said really struck me and I asked him if he was a coach, turned out he was! 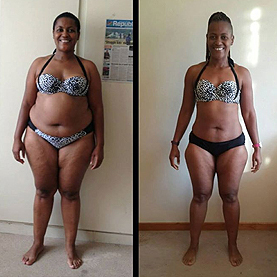 In July 2016 I made one of the BEST investments of my life… I signed up with CSB Bodyfusion. I faffed around for the first 6 months, I would binge eat and not follow the plan and then hide away from Craig and then in January of 2017 I decided to see what would happen if I just gave 100% and followed the plan… And like MAGIC (and by magic I mean hard work, sacrifice, commitment, sweat and dedication), my body has been transforming in ways that I never thought possible. I have muscles, I am strong, I am becoming lean and I am the smallest that I have EVER been in my entire adult life!!! Craig Brown ranks in the Top 3 BEST things that have ever happened to my health and fitness. He is patient, wise, humble and such a well of wisdom! He has taken away so much of the guesswork for me which allows me to just live my fitness, go out there and conquer the world knowing that I have someone trustworthy who knows what they’re doing guiding me. Not only that, he is teaching me how to think for myself, how to tear apart the fads, not buy dreams and see through the bullcrap so that I can make the best decisions for my health in the long run. The results that I have obtained with Craig in the period that I have been with him supersede everything that I have tried on my own in years. And the best thing is that, I have not binged in a couple of months and I have no urges to do so either… I feel like FINALLY, after a lifetime of my existence being consumed (sounds like I’m exaggerating but it’s true) by weight issues, I am breaking FREE! And there is no price for that!